Flowers are pretty miraculous. Even as the snow flies and the wind howls—when the survival of something so soft and delicate seems an absolute impossibility—there they are. Biding their time beneath the surface. Resting. Restoring. Flowers know what we humans so often forget: Rest is not a luxury, it is a biological imperative. No rest, no restoration. No rest, no resilience. No rest, no beauty. I designed Dormant to be a warm & wearable reminder of the wisdom of flowers. After all, to survive the darkness—to bloom our brightest—we must all take time to rest. On the hand: 6” (15 cm) cuff to fingers. 7.75” (20 cm) circumference, at widest part of hand (above thumb). Flat: 6.25” (16 cm) length x 3.5” (9 cm) width. Madelinetosh Pashmina (75% Merino Wool, 15% Silk, 10% Cashmere; 360 yards [329 meters]). 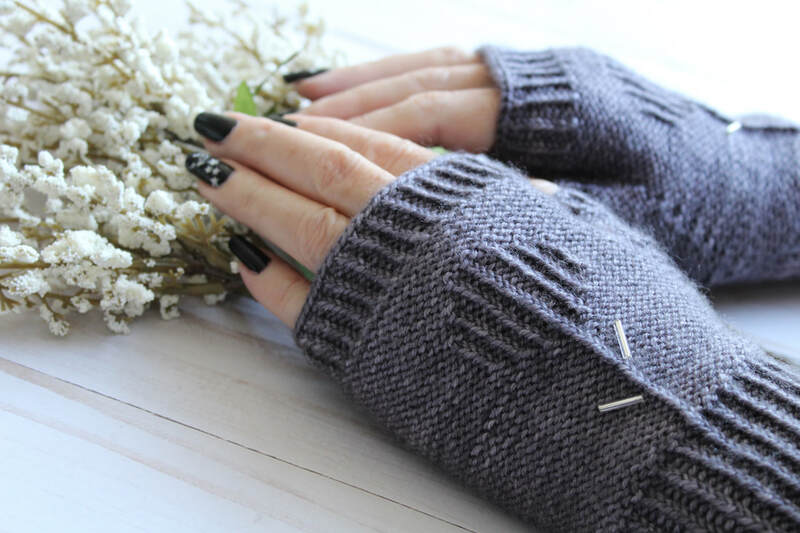 Sample gloves were knit in “Composition Book Grey”, used approx. 120 yards [110 meters], and weighed 38 grams [1.35 oz]. One 9” (23 cm) circular needle size US 1.5 (2.5 mm). Four double-pointed needles size US 1.5 (2.5 mm). Note: This pattern was worked using a 9” (23 cm) circular needle. If you cannot obtain, or dislike using, a small-circumference needle, double-pointed needles may be used throughout. 16 stitches & 21 rounds = 2” (5 cm) in Stockinette Stitch.